This is an AMAZING Movie Montage. 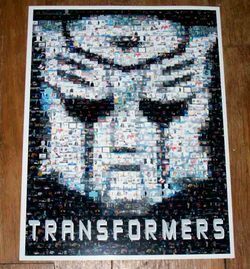 At first glance this looks like a picture of The TRANSFORMERS movie poster but look closer. Its actually 100's of mini-pictures that are 1/4 inch by 1/4 inch with remarkable detail (click on "close up" image). The mini-pictures are of Movie Lobby cards from some of the biggest and best films of recent years including comedies, dramas, sci-fi, action and more. Actual promotional theatre displays issued by the major studios. The entire item is 8 1/2 inches by 11 inches and perfect for framing. Great find for any movie fan! My work has been featured nationally on Coast To Coast AM and has been purchased by museums and professional athletes! Just check my latest feedback to be sure this is a high quality piece of work. Check my other Ebay auctions for GIANT 31 X 24 Wall Art editions too!! More than just a pretty picture. Try Vendio Image Hosting.